In the years before the ’45, any signs of Jacobite allegiance were suppressed. Jacobites had to meet and plot in secret. Because of this, a number of secret Jacobite symbols emerged, which revealed to those ‘in the know’ who was on their side. 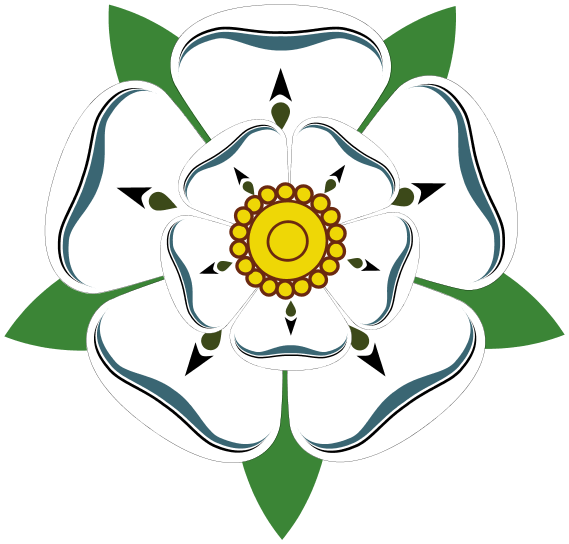 The White Rose – Used on its own it symbolized the exiled King James but it could be present with one bud symbolizing Prince Charles or two symbolizing Prince Charles and his brother Henry. Butterfly – known for its spectacular hatching from a chrysalis may symbolise hope for the Stuarts’ grand return from exile. Bundles of sticks – representing strength in numbers. 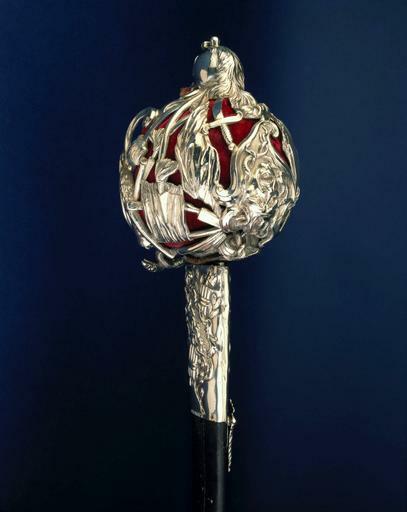 Thistle – representing the Stuarts’ claim to the Scottish throne. The thistle surmounted by a crown was an ancient badge of Scotland. As well as symbols certain phrases were also often used on Jacobite items. “Fiat”, meaning “let it be” or “let it come to pass” and Redeat, Redi, or Revirescit, suggesting hope that the prince will return. Due to the treasonous nature of Jacobite affiliation symbols were an important way of conveying Jacobite loyalties in a covert way. Jacobites would often drink a toast to the king ‘over the water’ in glasses encoded with these secret symbols. Often a glass of wine would be held above a bowl or glass of water as a toast to the health of the king was offered; thus literally toasting the king over the water. Some of the earliest Jacobite glasses are the so-called ‘Amen glasses’. These are engraved with a crown, representing the Stuart kingship, and one or more verses of the Jacobite Royal Anthem – sung to the tune of ‘God Save the Queen’ – all of which conclude with the word Amen (Let it be thus). The anthem probably dates back to the time of James II, its reference to the ‘true-born Prince of Wales’ being a refutation of the rumours surrounding the legitimacy of James III’s birth. Less than 40 Amen glasses are known to have survived. 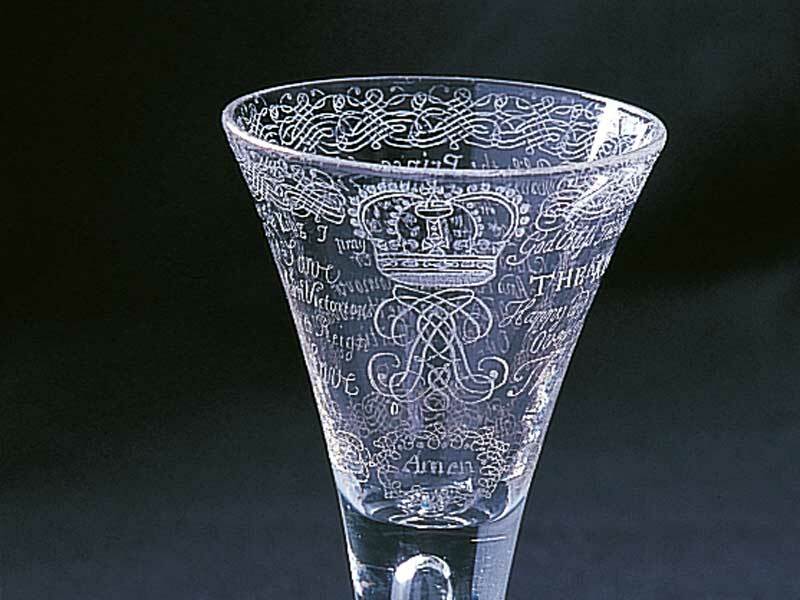 The majority of Amen glasses are engraved with the first two verses of the Jacobite anthem, and a smaller number with the first three or four verses. Analysis of the handwriting on genuine Amen glasses suggests that they are all the work of a single hand, and were all executed between 1743 and 1749. The artist concerned has been suggested as Scottish line-engraver Sir Robert Strange. Strange trained as an engraver in Edinburgh, joined the Jacobite army in 1745, married ardent Jacobite Isabella Lumisden in 1747 and moved to France in 1748. He returned to England in 1750 and pursued a highly successful career as an artist. One final hidden Jacobite message which is just a little bit different. Some believe that the popular Christmas carol ‘O Come All Ye Faithful’ is actually a Jacobite call to arms. The Latin version of the carol, Adeste Fideles, celebrated not the birth of Jesus but the birth of Prince Charles Edward Stuart. It was written by John Francis Wade an English Jacobite who fled the country after the failed 1745 Rebellion. Fideles is Faithful Catholic Jacobites. Bethlehem is a common Jacobite cipher for England, and Regem Angelorum is a well-known pun on Angelorum (angels) and Anglorum (English). So ‘Come and Behold Him, Born the King of Angels’ really means, ‘Come and Behold Him, Born the King of the English’ – Bonnie Prince Charlie. The English translation was not made until 1841 by which time the Jacobite connotations had been lost. Hopefully you’ve enjoyed this post and as always please like, share, tweet, comment, follow, reblog and raise a glass of your own to whomever your ‘king over the water’ may be.